Google Apps for Education seem to be here to stay. Whether or not your school has bought in to the model as a whole, there are a lot of free tools available that are a great fit in the World Language classroom. These apps can be adopted piecemeal or as a whole, depending on your level of comfort. This webinar will give an overview of several Google Apps and examples of their use in the World Language Classroom. The edTPA is a national, subject-specific performance assessment of preservice teachers’ readiness to design and enact standards-based instruction. 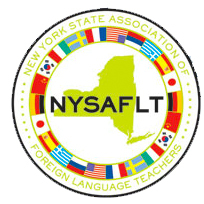 In New York State, the edTPA also serves as a teaching certification requirement. This webinar will unpack the design and expectations of the World Language edTPA and identify strategies for successfully completing it. Preservice teachers, cooperating teachers, methods instructors, and all language educators interested in current practices in teacher certification will find this webinar both practical and informative. Learn to incorporate culture into your yearly lessons. Get ideas, traditions, and how to execute cultural projects in the elementary classroom. We will discuss the importance of practicing culture in the classroom as well as how it can be delivered to the children, parents and community. Creativity is always recommended in any field but when we talk about learning a language it turns into a super strong tool that every teacher should consider using. As an illustrator, teacher, and creator of the program ‘Learn Spanish Love Español’ used in the Instituto Cervantes New York & Chicago, I will show you the way I use it when teaching Spanish, and I can also suggest tips to make your classes more interesting both for your students and for yourself. You don´t have to be an artist to be a creative teacher. It´s surprising how fast students learn when they are inspired! Do you find yourself in a rut doing the same activities over and over again? Do you wish your students were excited to learn a foreign language? Spice up your language class with activities and games that will get your students moving, talking and having fun. We will share our top ten activities that will be mostly kinesthetic and will include games and technology, such as sites, speaking assessments and more. Join us and bring the enthusiasm, energy and eagerness to learn back into your class! Skillful use of the NCSSFL/ACTFL Can-Do Statements can help teachers build student proficiency in an engaging, effective and efficient manner by being able to focus instruction on the essential elements of communicative modes of each level of the ACTFL Proficiency Guidelines. In this presentation, participants will identify essential characteristics of the “Can-Do Classroom;” examine instructional decision making for each proficiency level concerning text-type and language functions; and analyze research-based best practices for facilitating proficiency development.